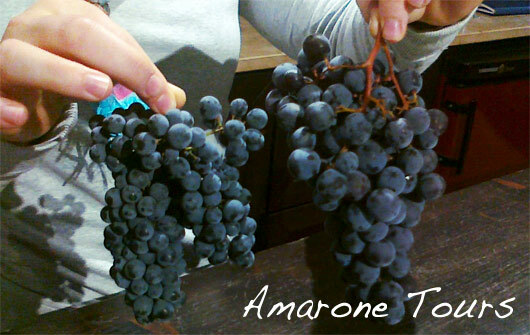 Amarone is a wine with a long tradition and history that made it what it is today. In order to help preserving this heritage Amarone, from the vintage 1968 was registered as a DOC wine and from 2010 became a DOCG wine. In Europe there are many appellations for quality food and beverage products, sort of registered “brands” that can be used only by those producers that are following a quite strict set of rules, often including a delimited production area where a specific product can be manufactured. When a winemaker produces a wine in a registered quality label region, if he wants to put that “brand” on the label, he has to grow the grapes best suited to that region’s terroir and has to utilize the winemaking techniques that best complement what the region can produce. Almost all the wines that fall into these quality classifications are namend not for the grape variety used to produce them but for the wine producing regions in which they are produced. Amarone is such a unique wine that its name does not refer to the production region where it is made, Valpolicella, that is also a DOC appellation of a wine, but refers to a specific wine, with its onw story. In France, that has one of the oldest legislations in the world for the protection of quality wines, there are the AOC (Appellation d’Origine Contrôlée) appellations, or the Grand Cru, Premier Cru, etc, classification of vineyards within a specific territory. In Italy, appellations of wines are DOC (Denominazione d’Origine Controllata) and DOCG (Denominazione d’Origine Controllata e Garantita) for wines. Most Italian top wines fall under DOCG regulations: Barolo, Barbaresco, Brunello di Montalcino, Nobile di Montepulciano and of course Amarone. These production regulations do not only protect the wineries that make Amarone from competitors of other regions or nations, but also ensure that only wines that are up to a certain quality standard can be called Amarone. 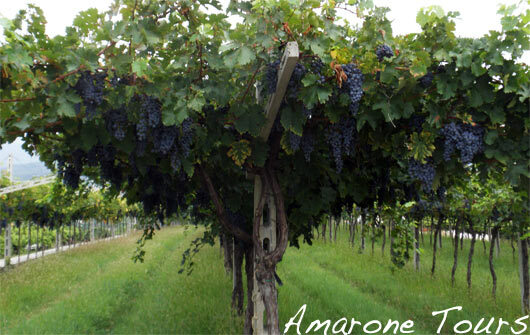 Amarone is the result of a mix of territory, microclimatic conditions, unique grape varietals, wine making traditions. Knowing DOCG production rules of Amarone will not give you the recipe to make Amarone, but will help you understand how Amarone is made. 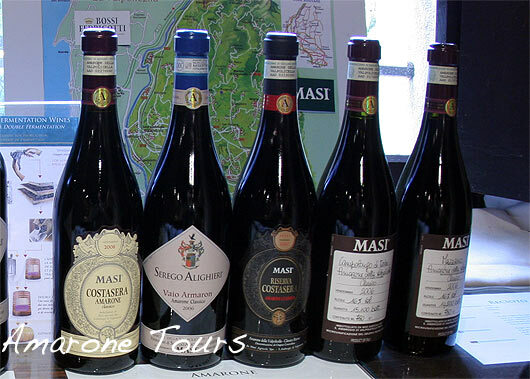 Production rules of wines with Denomination of Origin Controlled and Guaranteed “Amarone delle Valpolicella”. From the vintage 2010 Amarone will become a DOCG wine. The very first bottles of Amarone 2010 will be released in 2013 but you can already find on the capsule of Amarones now on the market the registration number identifying each single bottle as it happens for DOCG wines. The appellation of origin controlled and guaranteed (DOCG) “Amarone della Valpolicella” is reserved to wines with the characteristics required by the following regulations in force from the year 2010 harvest. 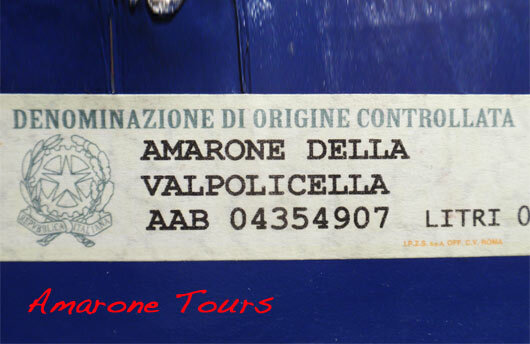 1) The controlled appellation of origin “Amarone della Valpolicella” already registered as DOC with the DPR 21st August 1968, is reserved to wines meeting the requirements of the following production regulations for the types of wine: “Amarone della Valpolicella” also with specifications “Classico”, “Valpantena” and “Riserva”. Close-up on a bunch of Corvina grape soon after arvest. Corvina is easily recognizable from the shape of berries that are not perfectly round bus slightly oval. – Corvina Veronese (Cruina or Corvina) between 45% and 95%. It is nevertheless allowed a percentage of Corvinone up to 50% in substitution to a similar percentage of Corvina. – Rondinella between 5% and 30%. Corvina (on the right) Vs Oseleta (on the left). Thanks to its characteristics Oseleta, in recent yeards, has become one of the most popular grape varietals used in Amarone grape blend. New vines of Oseleta are been planted but its availability is still quite low. Non aromatic red grapes allowed to be grown in the province of Verona up to 15%, with a limit of 10% for each single grape varietal. 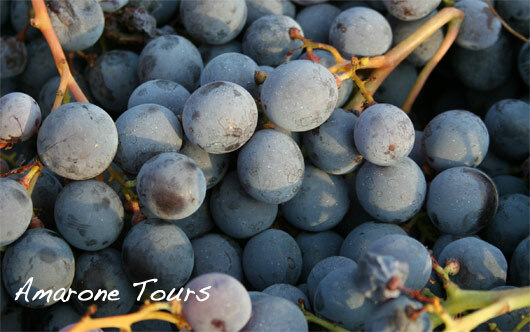 Classified as Italian autoctonous grapes allowed to be grown in the province of Verona up to 10% of the total amount. 1) Production area of wines with controlled and guaranteed denomination “Amarone della Valpolicella” includes all or part of the territory of the municipality of: Marano, Fumane, Negrar, S. Ambrogio, S. Pietro in Cariano, Dolce, Verona, San Martino Buon Albergo, Lavagno, Mezzane, Tregnago, Illasi, Colognola ai Colli, Cazzano di Tramigna, Grezzana, Cerro Veronese, San Mauro di Saline and Montecchia di Crosara. Vineyards for the production of “Amarone della Valpoliella” wines should be listed in the DOCG Register. 2) The production area of wines with controlled and guaranteed denomination of origin “Amarone della Valpolicella” with the specification “Classico” includes the municipality of Negrar, Marano, Fumane, Sant’Ambrogio. S. Pietro in Cariano. Typical “pergola veronese” trailing system. The trunk is kept quite tall and then it splits in two with a wide V shape that creates a sort of canopy, “pergola” in Italian. 1) Environment and cultivation conditions of vineyards for the production of Amarone must be those traditional of the area and, in any case, suitable to give grapes and wines their specific characteristics. 2) Therefore, in any case, should be excluded from the inscription in the DOCG Register, vineyards located on rich soils, situated on the plain or at valley bottom. 3) Trainig and pruning systems should be those commonly used and, in any case, done so that they do not modify the characteristics of grapes and wines. 4) Vines must be trained exclusively with the guyot or with the single or double pergola veronese systems. 5) For those vineyards already registered within the “Valpolicella” DOC production area before the approval of this regulation and grown with pergola veronese or with the single or double pergoletta veronese it is allowed to use the denomination with the limits stated in the following article. 7) The minimum amount of vines per hectar, exept for those vineyards already registred, should be not inferior than 3.300, that can be reduced for those vineyards on terraced slopes, with the authorization of Veneto Region authority. 8) It is forbidden any forcing (fertilizing, watering) practice but it is allowed rescue irrigation. 10) Maximum production of grapes used for the production of Amarone della Valpolicella wines should not exceed 12.000 kilograms per hectar. Grapes should have a minimum natural alcoholometric title of 11%. 13) For the production of Amarone, grapes selected for the drying process, should not exceed 65% of the maximum production reported above. Exceeding grapes can be used for the production of Valpolicella and Valpolicella Ripasso wines. Grapes for Amarone drying on traditional racks: ‘arele’. 1) Wine output from grapes after the drying period should be less than 40%. 2) At the end of the drying period, grapes should have a minimum natural alcoholometric title of 14%. 3) The drying process of grapes should be conducted in appropriate environment and can be helped by the use of air conditioning systems as long as they operate with temperatures similar to those that can be found during the natural drying process. Any dehumidifying or heating system is not allowed. 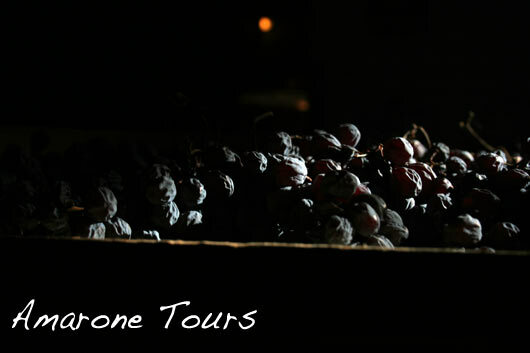 4) Dried grapes for the production of “Amarone della Valpolicella” wine, cannot be processed before December 1st. Nevertheless, due to particular climatic circumstances, Veneto Region, upon request of Valpolicellla Producers Consortium, can atuhorize wine production before December 1st. 5) In wine making, only local, fair and constant oenological techniques can be used in order to give wine its distinctive characteristics. 6) Before being relased on the market, wines labelled “Amarone della Valpolicella” must undergo a period of ageing of at least 2 years from January 1st of the year following the vintage of the harvest. Wines “Amarone della Valpolicella” labelled “Riserva”, should undergo a minimum ageing period of 4 years from November 1st of harvest vintage. Color: deep red, possible garnet shades with ageing. Palate: full bodied, smooth, warm. Maximum residual sugar content: 12 g/l for an Amarone with alchol content of 14%. Every 0.10% of alchol content increase above 14%, and up to 16% of alchol, it is allowed an increase of 0.1 g/l of sugar. Above 16% of alchol content, it is allowed an additional 0.15 g/l of residual sugar for each 0.10% of increase in alchol. Dry extract: 28,0 g/l and 32,0 g/l for Amarone “Riserva”. 1) On the label of wines of the appellation of origin controlled and guaranteed “Amarone della Valpolicella” it is fobidden to add any specification beside those allowed by this production regulation, including worlds such as: “extra”, “fine”, “selected”, etc. 2) It is allowed the use of indications referring to names, companies, private brands and consortiums as long as they do not have any laudatory meaning and are not misleading for consumers. 3) On the label of wines “Amarone della Valpolicella” can be used the indication “vineyard” (vigna) as long as it is followed by the corrisponding toponym, the specific vineyard is reported in the DOCG Register of vineyards and the drying, fermentation and ageing of the wine occurs in separated containers. 4) On the label of wines “Amarone della Valpolicella”, for all different typologies, it is mandatory to specify the vintage of the production of grapes. Different Amarones with different labels but all in the traditional Bourgogne style bottle. 1) All wines designated with the appellation of origin controlled and guranteed “Amarone della Valpolicella” shall be relased on the market inside traditional glass bottles with capacity not exceeding 5 litres and with an appearance adequate to wine characteristics of quality. For promotional purposes, upon authorization of the Ministry of Agriculture, wineries are allowed to use bottles of 9 and 12 litres capacity.